Take a seat onstage alongside Chetham’s Symphony Orchestra to share in the rehearsal process for Elgar’s Enigma Variations. Presented by Director of Music Stephen Threlfall, this is your chance to experience an orchestral masterwork from a player’s perspective – and perhaps even to take up a bow or a baton yourself! 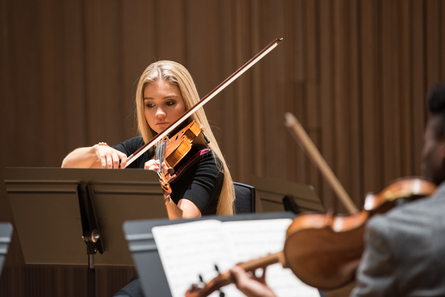 With your ticket to Inside the Orchestra, enjoy a 30% discount when booking for Chetham’s Symphony Orchestra: Enigma Variations on Thursday 14 February. Book both tickets in a single transaction for the discount to automatically apply. Seating is unallocated – this event takes place on the stage. Please use the comments box to let us know if you will require any access assistance.